There is something about the Sam Edelman brand that I am absolutely obsessed with. If you are like me, you have that favorite "go-to" piece that is loyally standing by as back up, just in case you are ever in a pinch with an outfit. 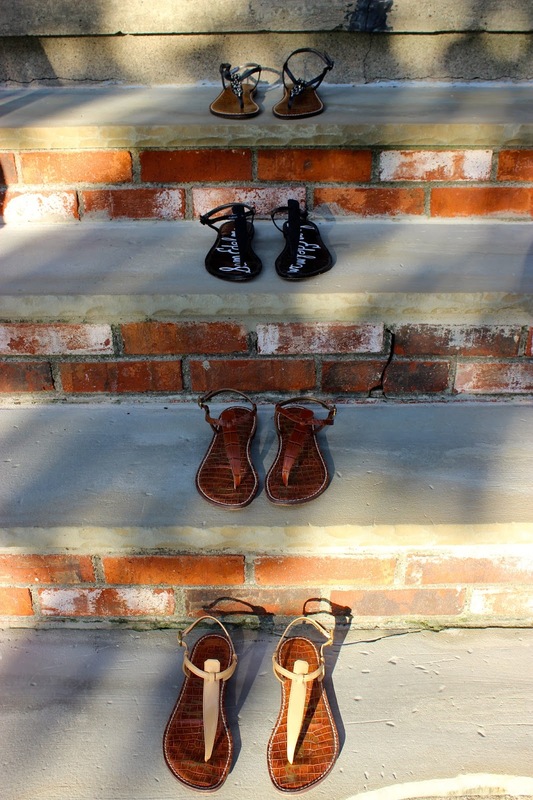 My"go-to"has been my Gigi sandals which I have been living in all summer. They are chic, comfortable and worth every penny. I've worn them with shorts, skinny jeans, boyfriend jeans and several of my maxi dresses. Even though they are exactly the same style sandal, they all seem to have very different personalities. Yes, I did just say my shoes have personalities, don't judge. I have never seen one specific style shoe have so many different options as far as texture and color combinations. There's a "Gigi" for everyone! With over 30 years in the shoe business, Sam Edelman (and don't forget his wife Libby) know what they're doing when it comes to shoes. They combine high end quality, style and comfort with affordable pricing. What more could a girl want? In fact, I may have to take another trip to Nordstrom Rack this weekend to add to my collection. Sam Edelman Gigi sandal// first pair was an in store purchase at Shoe-Inn // All others: in store purchase at Nordstrom Rack $39.97. excuse me as i run out to find my "gigi"!!! u just made the sam and libby connection for me and their ballet flats!! !